Brewster by the Sea Inn is a charming Cape Cod bed and breakfast featuring luxury suites, a sparkling pool, colorful gardens, and on-site spa services! Escape to our romantic Cape Cod bed and breakfast, centrally located in the sea captain’s town of Brewster. Each of our charming guest rooms and luxurious suites offers their own unique personality and thoughtful amenities, including glowing fireplaces, private patios, and our favorite lavender bath salts. In the evenings, enjoy relaxing with a glass of wine beside our outdoor seasonal pool surrounded by beautiful gardens, or take a nature walk to the close by bay beaches. Pamper yourself with one of our signature spa treatments, available in your room or our poolside gazebo seasonally. Start every day with a hearty, 3-course fireside breakfast and come back to afternoon treats! 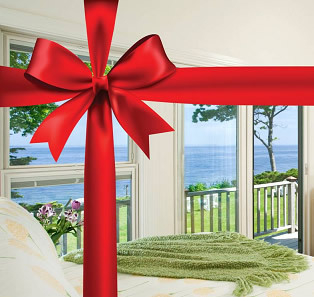 You’ll find a million reasons to love Brewster by the Sea Inn, a casually elegant bed and breakfast on Cape Cod! Children Policies: Age Restriction relaxed in the offseason - November through April.